Well Spring is here, that means the beginning of Grilling Season! We used our grill last night for the first time! So excited!! Even if there is still snow on the ground - ha ha! And we are excited about our Cave Tools! 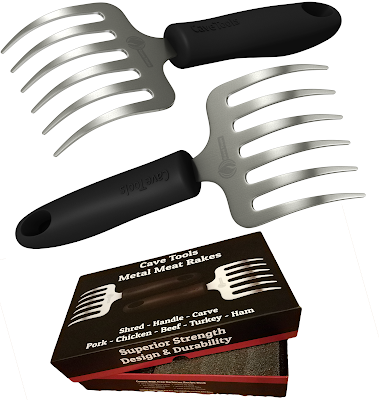 We got the Pulled Pork Shredder Meat Rakes. Ultra Strong Stainless Steel dominates chicken, beef, brisket, turkey, poultry, hams, roasts, and anything from your slow cooker, grill, or smoker in record time. Extended handles and bear paw shaped claws provide extra leverage so you never drop another turkey again by trying to pick it up with oven mitts. These meat rakes are the ultimate multi purpose kitchen tool - you'll wonder how you ever got along without them. Also the perfect gift idea for men or women. Step by step instructions and detailed tutorial videos are great for the family. Check it all out at Cave Tools on Facebook, as well as Cave Tools on Twitter.